The Eureka razor sharpener is the answer to the extremely expensive multi-blade razors from the market leader Gillette and Wilkinson. The razor blades are changed because they no longer shave properly. The razor blades, the successors of razors, are like all “cutting instruments” – they have to be sharpened. With a knife, the blades are removed with a sharpening steel. Razors are removed with a leather strap before each use for maximum sharpness. What do you do with razor blades – nothing! The Eureka Rasierkingen Sharpener is made of massive Red Alder. The surface of the leather is tuned with a special method for razor blades. The leather is vegetable-tanned in Germany. Before (any) use, simply push the shaver over the leather several times, OPPOSITE to the shaving direction. As a result, remains of skin, hair and shaving cream residues are removed. The razor blades get sharp again and hold up to 100 shaves. This saves a lot of money and relieves the environment. The Eureka razor blade sharpener is suitable for almost all standard razor blades. A word about the razor blades of the market leaders Gillette and Wilkinson. These blades are designed for use, depending on beard growth, from 4 to 8 times. The steel of the blades is relatively hard. Now it has been found in an attempt that the optimal blade for re-sharpening should not be so hard, because more difficult to regrind. Extends the life of a modern (expensive) razor blade by 5 to 6 times. You save, at prices of about € 14,- to € 20,- for 8 pieces, huge. Eureka, wood and leather, made in Germany. 10-year guarantee for the product! Why are razor blades changed frequently? Because they are not sharpened! With a knife, it is normal to sharpen it with a sharpening steel! With the razor blade precursor, it is normal for the razor to be handled on a stropper before each shave. Knives, including razor blades, are subject to wear. development of the Eureka Razor Blade sharpener. Until the beginning of the 19th century there was only one possibility of shaving; with a razor, which is relatively difficult if you do it yourself. It became increasingly uncommon in Germany to resort to razors. Instead, they went to the barber, a trade that took a strong upswing in Germany in the 1890s. According to Gnegel stood in 1895 43,500 workers in the barber industry only 16,900 in the hair stylist industry against. The razor was not only used in full face shaving, because even mustache wearers could shave parts of the face with a knife. All this changed with the patent for a safety razor blade from King Camp Gillette. For this he founded the Safety Razor Company in 1901. In 1902, the company was renamed Gillette Safety Razor Company. keep the prices of his razor blades high despite cheap competition. From King Camp Gillette comes the statement “Give them the razor – sell them the blades”. And so they do it today: The razor extremely cheap – the blade in the purchase expensive. The manufacturers of inkjet printers are copying this system with cheap printers and expensive ink cartridges. That was relatively expensive and the first experiments were made to sharpen the razor blades to save money. Razor blades became really popular with the world economic crisis in the 1920s. It was the time when tinkerers and entrepreneurs devised cheap razor blades by re-sharpening, since the money was extremely scarce and therefore new blades for many unaffordable. 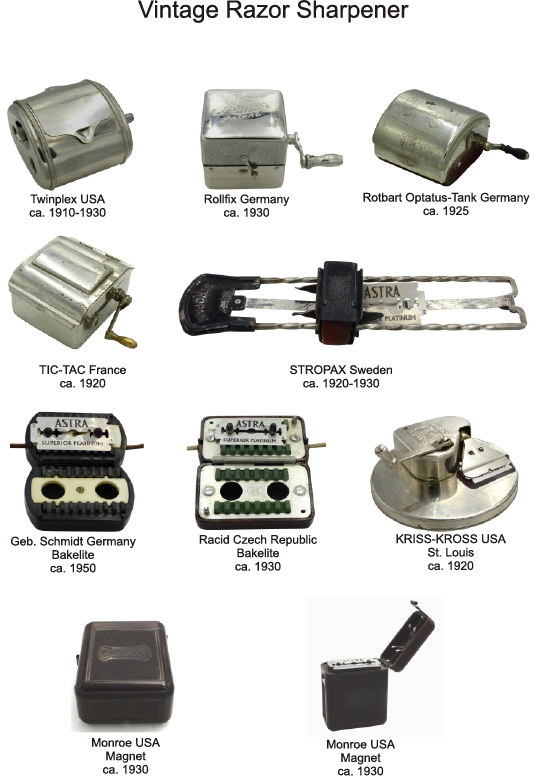 The razor sharpeners were produced in many countries. Our collection comes from Czechoslovakia, France, Sweden, Germany and the USA. In the year 1971 Gillette started to sell the first razor with 2 blades; the Trac II. 3 blades; the Mach III. All these blades cannot be used with the existing Razor Sharpeners. The production of Razor Sharpener poduction stopped. At the same time, the safety blades for razor planers have become cheaper and cheaper. Sharpening is no longer worthwhile. Conversely, this is extremely expensive with today’s multi-blade razors. Here sharpening is really worthwhile and saves a lot of money. because the market does not offer anything functional. The “Blade Master” has been sold at Amazon since 2005. This sharpener uses the “energy of magnets” to sharpen the blade. I guess that’s for esotericism. Our verdict: Doesn’t work! If you are wondering how to get 74% positive feedback? of fake ratings: WARN – Unnatural reviews possible! Amazon also offers the Sharpener RazorPit manufactured in Vietnam. between mat and housing and makes cleaning difficult after each use. The second disadvantage is the construction of the sharpener. The silicone mat has a width of 54 mm. The width of the blades between the bars is approx. 34 mm. The blade cannot be completely treated because the bars prevent this. Other razor blades sharpeners do not play a role in sales. tanned leather, as it has been proven over 100 years with razors. On a solid block made of Red Alder, we have glued best Russia Leather, which is vegetable tanned. The width of the leather is 33 mm – so that the razor blades rests fully, but not the straps of the razor blade! Gillette and Wilkinson and even with blades from discounter. Before shaving push the razor over the leather a few times with slight pressure against the cutting direction. and the blade can withstand up to 80 shaves, saving a tremendous amount of money. Eureka razor blades sharpener – a purchase worthwhile! – Made in Germany – The wood as well as the leather.